...that actually was the question today. My dad and his missus are visiting from France this week. They aren't staying with us, we simply don't have the room (and frankly, as much as I love my dad, we're better not together 24/7) but we are spending a few days with them. Today was the first. Now (and again, I DO love him, but....) my dad is not the most observant of people, and I should have kept this in mind. The kids wanted to take their Mamee & Papee (their take on the French for Gran & Grandad) to Old Holly Farm. Jack wanted to show them how to feed his favourite calf, Tom wanted to show them the piggies. I don't think Georgie cared so long as they were doing something. I quite liked the idea of them running off steam in the Play Barn while we caught up over coffee and cake. We had a nice time, ate a good lunch, saw the animals and so on (there's a wee video of that) then settled into the soft play for a couple of hours. Every so often one or other of the kids would come and ask me to play so I'd duck in and chuck them about for a bit and then come out for a while again. My dad wanted to join in too so we had a ball-pool-ball war! Basically we chuck balls at each other. The rules are you don't throw hard enough to hurt, and you don't throw in faces or at heads. If you do, you're out (health & safety AND fun!) It was all going great! Kids against us old foggies! After a while I thought I better go and check on Georgie and Mamee, and grab myself a quick drink too. War is thirsty work! Jack & Tom were happy chucking themselves over Papee and he was enjoying the kids. 30 seconds I'd be, I that. No sooner had my bum hit the seat and I lifted my glass of strawberry milkshake to my lips than Jack appeared.... Looking distressed and BLEEDING FROM THE HEAD! I rushed to him and took him to get cleaned up. Tom came trotting after shortly followed by my dad wondering where the kids had run off too. Next came a member of staff. Turns out Jack had dived off the soft play into the netting, and some numpty (guessing another parent) had moved a table too close to the other side. Having been there before I can say this with certainty, there isn't one just there normally. He had smashed into the corner of this table WITH HIS HEAD! Head wounds. There's nothing like them for bleeding! But Jack was amazingly brave and let me clean him up. A hole in his head. Not a gash or a graze, a HOLE! The lady from the staff was fussing about us, cold compress, accident form, antiseptic wipes, why are we photographing the cut, more antiseptic wipes... (Only took a photo coz Jack is grim and wanted one!) and we talked about taking him to Accident & Emergency at the hospital. Jack was determined not to go. He swore blind he had no dizziness, sickness, blurry vision, etc. I'm looking at the hole in his head and thinking "that needs a stitch". He just wants ice-cream. So we plumbed for ice-cream thinking that if he was going to start feeling sick and not want to tell us, a belly full of ice-cream might highlight it quickly! If you get my meaning. Plus it gave us time to observe him and if he showed signs of concussion. He didn't. He ate his ice-cream and was running around like a loon! I'd called hubby by now and told him what had happened. I said we'd planned to take him home, see how he was, and pop him up to A&E if needed. Before driving home I insisted that Jack told me if he felt off, even if he just felt sleepy before bedtime. Half way home he pipes up "Mummy...you know you said I had to tell you if I felt sleepy?" I'm already planning the fasted route to hospital "I'm the only one still AWAKE back here!" Both his brothers had fallen asleep. I smiled and drove him home. 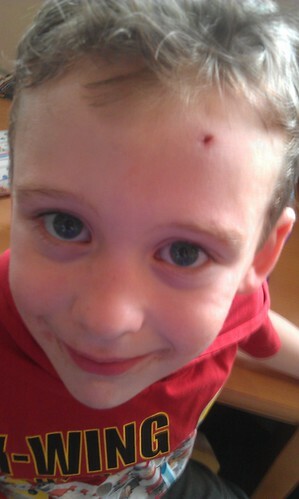 He'd started to bleed a little again when we got in, so i cleaned him up again and stuck a plaster on. I called the doctors for advice. Could they put a stitch in? In short no, but I could book an appointment to get it looked at, and if he did need a stitch they'd get us booked in at the hospital.